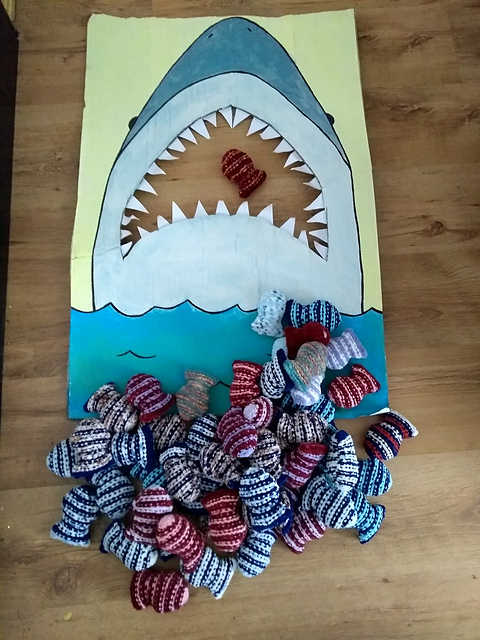 Home › Knitting › Feed the Shark! It was Felix’s fourth birthday on Thursday, and subsequently we had a party for her, her friends and school friends. At her request, we had an Octonauts themed party – pin the eyepatch on Kwazii, Octonaut skittles, paper plate whales, Octonaut colouring sheets…there was also decorating cupcakes but how does this relate to knitting? Because of the best game ever! As well as the party bags that get handed out, I’m putting together a ‘Feed the Shark’ game where kids toss fish into a cardboard cutout sharks mouth. For completing this Octonaut Mission, they got to pick a fish and put it in their party bag. I used the free pattern: Fishies by Jackie Ziegler, and had over sixty for the party! Took a photo of what was left afterwards, as well as the rather beat up shark – clearly he’s suffering from indigestion! (It was the selfies at the I end with the kids putting their heads through the mouth that did it really!) It was also the most popular game at the party, so mission success! ‹ Pusheen the cat scarf and pattern!